Munich - Young guns such as Julian Draxler and Mario Götze may have stolen the limelight during the Bundesliga’s 50th season, but the contributions of the wiser, more experienced players are not to be underestimated, whether it be Timmy Simons’ superb strike against VfL Wolfsburg or Roman Weidenfeller’s heroics for Dortmund. However, one man who regularly spared the blushes of his team-mates, almost single-handedly guiding his side to within a few points of European qualification and scoring some sensational goals to boot, was Venezuelan international Juan Arango, whom readers of bundesliga.com voted as the best veteran player of the season. In his fourth campaign in Germany's top flight, Arango reached the milestone of 100 Bundesliga appearances during a 2-0 win at home to Eintracht Frankfurt on Matchday 7. 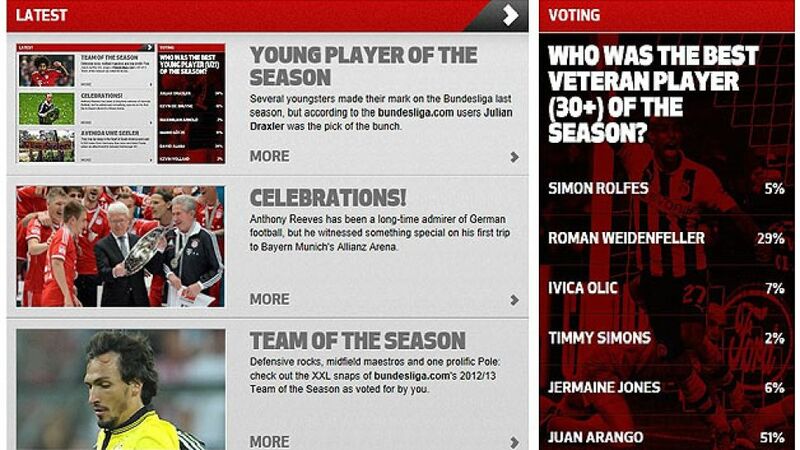 Though Arango and Co. ultimately fell four points short of clinching a place in Europe next season, his performances certainly caught the eye as he stormed the poll, collecting 51 per cent of the bundesliga.com users’ votes. Finishing 22 per cent behind Gladbach’s left-footed veteran was second-place Roman Weidenfeller, who played a pivotal role throughout the season for Borussia Dortmund, most notably in the UEFA Champions League final defeat against Bayern - a game in which he made a string of top-class saves. However, with the top two leading the way by a substantial margin, there were slim pickings for the rest of the contenders, who amassed just 20 per cent of the vote between them. Croatian international Ivica Olic clinched the final podium place after his resurgence in the second half of the campaign earned him seven per cent of the votes, while falling narrowly short of the bronze medal was USA international Jermaine Jones. Simon Rolfes, who provided three goals and one assist as Bayer 04 Leverkusen finished third, collected just five per cent of the votes, while 1. FC Nuremberg’s second top goalscorer Timmy Simons brought up the rear with just two per cent.